bitforms gallery is pleased to announce The Birdwatchers, a group exhibition featuring work of four contemporary artists that observe nature and repurpose it within altered landscapes, as part of their interdisciplinary practice. 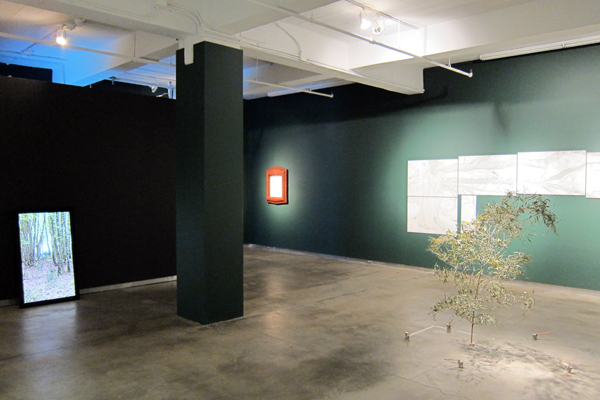 The exhibited works include physically animated plants and animals, video, animation, letterpress prints, and drawing on paper. What is it about bird watching? Is it related to the urgency to comprehend, forecast and, later, control our immediate environment? The definition of nature always was, and still is, in flux. And yet, the notions of nature, and its representation, that we still embrace today originated at the end of the nineteenth century. During the Victorian era, there was a major shift in our understanding of the natural world and emphasis was placed on close observation of organisms. As humankind’s relationship with nature transformed, enthusiasm for walks in the woods, bird watching and collecting shells, grew. Currently, our apprehensive care of the environment goes along with our decreasing contact with nature. Many of us are unable to name our local trees or birds, many have no clue about how plants and animals interact with our surroundings. And yes, while we may be loosing connection with the natural world, we certainly have increased our interactions with ‘technological nature’. Artists have always used nature, as subjects of inspiration or objects of manipulation. Art that engages nature can establish connections to a wide range of scientific, historical and philosophical concepts. Advances in biological and telecommunication technology make our interference with natural systems both sophisticated and substantial, modifying the way we look at and represent nature. It is human nature to compare, describe, and sort in order to form our own explanations of the world. We strive to acquire better understanding, prognostication, and control of our surroundings. But is there a purpose to observation if action is not taken? Gabriela Albergaria’s projects are concerned with the relationships between the subtle and minute components of life and the large-scale appearance of the world. In her work “Fictional Landscape”, Albergaria considers the notion of a space where any two points can be joined by a path, and creates an artificial garden, drawing an impossible connection and unreal perspective between two trees distant from each other. In a forest clearing, Jeffrey Blondes’ “La Taille des Antes” uses a mounted camera on a motorized turntable, recording one fluid 360-degree rotation over the course of a year in weekly segments of 27 minutes, 41 seconds and 13 frames each. The completed 24 hour loop reveals a slow evolution in real time, over four seasons, beginning and ending on the Winter Solstice, a romantic quote on the traditional schemes of landscape painting. Adriana Salazar engineers “Moving Plants” and “Birds” constrained to follow the artist’s will. Instructional mechanical movements, using custom electronics, are imposed onto Bamboo branches and taxidermy feathered, winged, bipedal vertebrate animals. Adriana’s work, undertakes extreme path through the woods of bio art and wildlife management. Marina Zurkow’s artistic practice leans towards environmental engagement, looking into novel and change over time in response to software-driven data inputs. The artist designs narrative spaces that bring together environment elements, under controlled conditions, into a complex dynamic composition.